Fear of the unknown whether it is flying or citing sources can be paralyzing, so much so that many genealogy researchers avoid using source citations altogether. Maybe it seems too much like school or perhaps they think it unnecessary. This is a huge mistake and one that usually causes regrets later. I confess, some of my documentation has unknown sources. Obituaries or articles cut from some newspaper with no page heading descended from family, but other items are from my early research when the fear of citing and the thrill of the find overcame thoughts of good documentation. Elizabeth Shown Mills, the first lady of genealogy, inspired me to document genealogy research correctly. Not because I plan to write a book, but so I can be confident of my documentation. You can overcome your fear of citing just like I did - read on! Three simple steps to conquer fear in citing sources are: Know the Basics, Upfront Details, and Seek Help. Knowing the Basics saves time and provides a level of comfort. When you know what to look for, the fear subsides and it is just another research task. Evidence! Citation and Analysis for the Family Historian by Elizabeth Shown Mills is an easy read, quickly reminds us why we need source citations and shows how to do the most common citations in genealogy. Mills uses the Chicago Style for citations in her books since it is the most accepted form for historical references. 1. Who created the record? 2. What type of record is it? 3. When was it created/published? 4. Where can it be found again? Do not panic! You do not have to actually write your source citation while you are gathering data, but answering these citation questions saves time and angst later. Consider carrying a copy of Mills' list of elements as a quick reference. Proofs from my research trips are piled on my desk when I get home. After my real job, late at night, I go back to my research. So, I search out all the source information before leaving a research location and keep it with the documentation. Then updating your files is as easy. Once you know what citation elements you need, the next step is just a search. Upfront Details applies to several things - first, get your source citation data as soon as you find a proof. 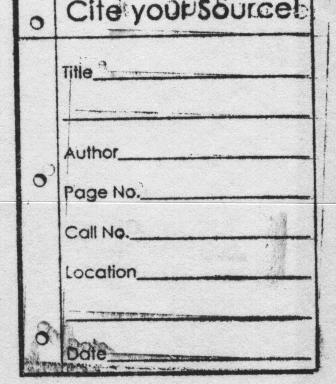 Additionally, upfront should remind you that most sources in book form have the information you need in the front - specifically, the title page front and back. If you copy both sides of the title page, you usually get the citation details for that source. For resources that are indexes or a data compilation, be sure to copy pages that describe how and what exactly was included. Although not necessary for general citation, this information is valuable for determining the quality of this source. The source citation note is a good place to identify the quality and or accuracy of the resource. My stamp does not have every detail for every source. However, in cases where there is no title page to copy, it reminds me to look for basic elements and to jot down additional details as needed. Stamps like mine can be inexpensively purchased from genealogy sites online and it just might save you from the fear of citing. Online resources are scary to cite for many researchers. Reliable online databases have source information and often a description of the data. Mills also created a quick reference pamphlet Quicksheet Citing Online Historical Sources Evidence Style as a guide to online citations. Finally, Seek Help is my best piece of advice. The easy way to cite your sources is to let an expert help you. The expert can be a book or a website, but this is not a do-it-yourself (DIY) area. Good news! There are websites that will create a source citation for you from the information that you input based on the type of source you choose. For example: Son of Citation Machine allows you to choose a format style (use Chicago whenever possible), gives you a form to complete, and then provides a source citation that you can copy and paste. Quick and easy for standard resources such as books, magazines or web pages, but the site has limitations for genealogists. Unfortunately, there are quite a few sources used in genealogy and nowhere else - this is when Mills' book is the most beneficial. For example, you can find citation examples for photographs, cemetery markers, or even family interviews. With genealogy becoming such a popular activity, more sources are recognized such as a personal Bible Record, family quilt, or even email. These items may or may not prove a particular date, place or person, but they are all valuable to document and support your family story. You are not alone in wondering how to document such a source. In fact, Elizabeth Shown Mills wrote another book, Evidence Explained: Citing History Sources from Artifacts to Cyberspace with hundreds of examples of genealogy source citations including atypical or unusual items. Take heart, fear of citing can be cured with a three step plan. Know the basic requirements, get your details upfront and then seek expert help to write the citation. Don't you feel that fear fading already?